The Free Women’s Congress (KJA) has released the report below about the impact of the current war against Kurds on the peace process. Also available here are two documents, one giving the names and details of some of the children who have been killed since July last year, and another that gives evidence of the deliberate targeting of Kurdish graveyards by security forces. Below is an excerpt from the latest information file published by the Kurdish Women’s Relations Office (REPAK. It details how women have been targeted by the Turkish state over the last several months. Public meeting and discussion with author Janet Biehl who talked about the new women’s science of “Jineology” and the revolutionary transformation of education. She has visited Rojava twice and reported on her recent visit. Organised by Peace in Kurdistan Campaign and Roj Women Group at Doughty Street Chambers on 23 October 2015. The meeting was chaired by Elif Sarican, Kurdish Student Union. Pedagogy for Revolution: The Case of Rojava With author Janet Biehl from Saman Gareeb on Vimeo. The Kurdistan Communities of Women (KJK) has published a new information file called 5 minutes to election: What happened during 20 days of PKK inaction in Turkey? which provides a useful summary of events in Kurdistan since the PKK declared a unilateral ceasefire on 10 October. The report details an alarming number of state-sponsored attacks on the AKP’s political opposition, including curfews in Kurdish districts, raids on HDP offices and military strikes against the PKK. The report begins with this statement below and is available to download in full here (pdf). Free women are the basis for a free society! This article was originally published in the Kurdistan Report. The goal of the Foundation is ambitiously high. Through their work, they want to support women in Rojava, Syria and South Kurdistan in the process of emancipation. They are working for a comprehensive psychological and medical support for women and children, managed by women themselves. Through their nurseries they are forming education for children of all ethnicities in every mother tongue, with the goal of equality between sexes, peoples and religions, and for ethnic and democratic coexistence. They make it possible for women to enter into the economy through establishing cooperatives, creating training opportunities and work for women in different fields, and open up spaces in which women can sell their handwork. Not last, they create living space for women, in which they have the possibility of working through their traumatic experiences of war and to develop their own abilities and talents. On Wednesday 23rd September at 4pm, a delegation of women delivered an open letter signed by a coalition of prominent women’s rights activists to 10 Downing Street. The letter urgently calls on David Cameron to use his influence with the Turkish government to stop the violence being perpetrated against Kurdish civilians in the south east of the country. The delegation includes Michelle Allison (Kurdistan National Congress), Evrim Yilmaz (Roj Women Assembly) and human rights barrister Melanie Gingell, who has just returned from a fact-finding mission to Cizre, south east Turkey, which has been under curfew for several days and which has been a flashpoint of violence between Turkish security forces and Kurdish civilians in recent weeks. CALL FOR ACTION: CHALLENGE CAMERON’S SILENCE ON TURKEY! Join us for a demonstration outside 10 Downing Street! 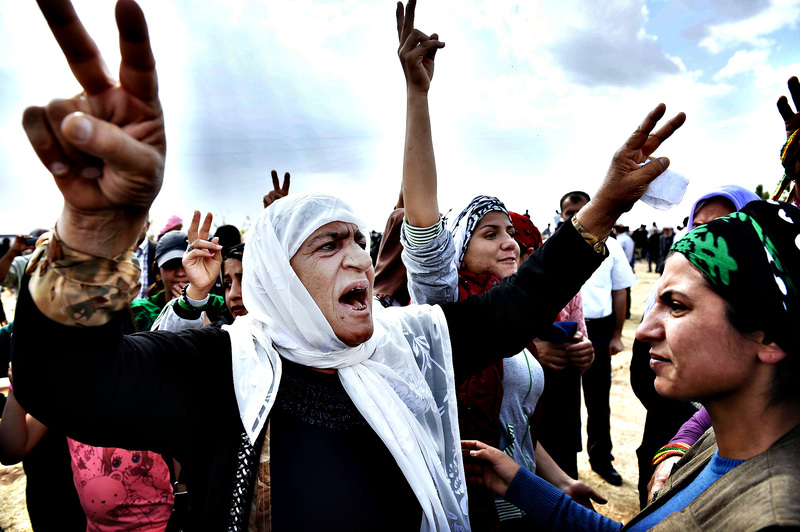 Kurdish women shout slogans during the funeral of a YPG (People’s Protection Units) fighter in the town of Suruc, Sanliurfa province, on October 14, 2014. On Wednesday 23rd September at 4pm, a delegation of women will deliver an open letter signed by a coalition of prominent women’s rights activists to 10 Downing Street. The letter urgently calls on David Cameron to use his influence with the Turkish government to stop the violence being perpetrated against Kurdish civilians in the south east of the country. REPAK: Turkish state is committing crimes against humanity! Urgent call: Turkish state is committing crimes against humanity! The Kurdistan Women’s Community (KJK) have released a report with their evaluation of the latest developments in Turkey and across the region. You can download the full report here and we have included below the first part of the report. Roadmap of the escalation: How did the Turkish-Kurdish conflict upsurge again?